Early 20th century Germany is well known for its art – both how it was celebrated and how it was persecuted. I have blogged earlier about the social realist work of Kathe Kollwitz, whose spectacular house museum I visited in Berlin. The modern art museum, Neue Nationalgalerie, also featured a number of artists, among them George Grosz, Max Ernst and Hannah Hoch, who were visible yesterday at Another World, the Surrealism exhibition at the Dean Gallery here in Edinburgh. Strangely, I never thought of such artists as surrealists, but the exhibition was brilliant for putting the work of artists into context with global art trends, as well as showing the links between artists who inspired and were inspired across countries and art forms. Dada seems to have originated in Zurich, where the term was coined and the first venue, Cabaret Voltaire, began publishing and producing the irrational and nonsensical art that responded to the irrational and nonsensical First World War. Dada was launched in Berlin in 1917 at Club Dada, founded by George Grosz, John Heartfield, and Hannah Hoch. 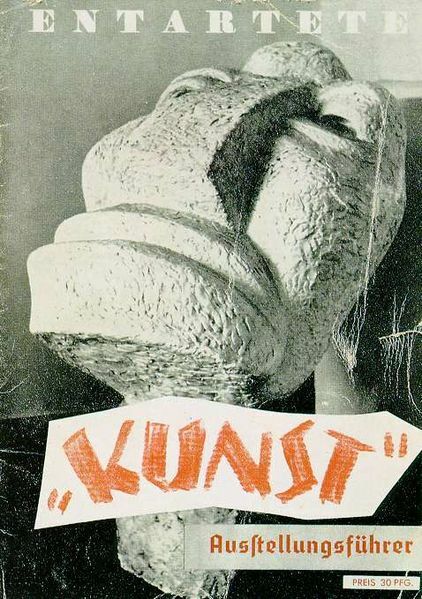 Other Dada groups emerged across Germany, with such artists as Max Ernst and Kurt Schwitters. But by the early 1920s the work was already shifting towards sur-realism from Paris, defined by Andre Breton as “pure psychic automatism by which it is intended to express, either verbally or in writing, the true functioning of thought.” Where Dada was created from the anarchic and ridiculous, Surrealism sought to delve into the intellectual and psychic realms of dreams and chance. Germany’s modern artists responded to Dada and Surrealism in a variety of ways and methods, and their artwork would be more openly political and satirical than any other city’s, particularly in the New Objectivity movement. George Grosz’s sharp and satirical cartoons of post WWI life in Berlin have made his artwork, alongside the work of Otto Dix, synonymous with the Weimar period, but it was the first world war itself that first honed his draughtsmanship and his politics, following his discharge from active service and a brief stay in a mental hospital. His line drawing, Fit for Active Service, shows a doctor approving a new recruit – a skeleton. Grosz’s early intention was to become the German Hogarth; Hogarth’s paintings of the perils of gin would be echoed in such works of Grosz’s as Dedication to Oskar Panizza, or The Funeral. Grosz also created a number of collage “corrected masterpieces,” pasting photographs onto old masterworks to lampoon politicians and figures of authority. Grosz introduced Otto Dix to Dada, and both would, in turn, start the Neue Sachlichkeit (New Objectivity) movement, a form of post-Expressionism in the 1920s and the leading Weimar art form that would fall only in 1933, when the Nazi party rose to power. Hannah Hoch is best known for her collages, created while she worked as a designer of crochet, knitting and embroidery pattern books. Some of her collages feature the embroidery mesh used in her designs. She also created photomontages as in the collection From an Ethnographic Museum, which places the head of an African sculpture onto the body of a child, along with a giant woman’s eye. Max Ernst would continue to use Dada forms such as collage, in both his art work and in his published “collage novels”, but would also develop a new interest in chance and the natural world in his “frottage” work, a kind of brass rubbing on rough surfaces from wood to stone. A lovely example of his transitioning between Cubist, Dada and Surrealist work is “Woman With an Umbrella”, a painting using pre-existing advertisement images on card. He also worked with frottage in his paintings, but found the canvas too thick to use for rubbing. Subsequent paintings would incorporate “grattage”, using forks and sticks to scrape through heavy paint, relying on chance, rather than technique, to make the painting. His work is always diverse, but I am drawn to it for the themes running through, from the romantic notion of German forests to the cut-and-paste fairytale picture books he made from conventional 19th century engravings, where giant birds embrace bustled maidens and streams run through domestic lounges. Kurt Schwitters is known for his collage work, incorporating strips and snips of newspaper, ticket stubs, feathers, found objects and textiles. He also created “sound poems”, aural collages, and 3D wooden collages. The spookiest example of German surrealist work has to be Hans Bellmer, whose life-sized, articulated dolls, all trunk, appendages and genitalia, most often sans heads. He ritualistically posed and photographed his dolls in woodland settings. The work was made in the mid 1930s, but I defy anyone to look at it and not think about the horrific experiments upon bodies that were to follow, come the war. Berlin lost most of its modern artists with the rise of the Nazi party, with artists arrested, interned, or forced into exile. But, ironically, the most interesting exhibition of all of this work would be put on show by the Nazis themselves in the infamous Degenerate Art Exhibit in Munich, 1937. Designed to turn audiences off modern art altogether, the Nazis rounded up and displayed over 5000 pieces from Germany’s museums and galleries that they found most offensive, work that did not match the rural “blood and soil” paintings and landscapes favoured by Hitler and his crew. After four months the show had attracted over 2 million viewers. “Degenerate artists” included George Grosz, Max Ernst, Kurt Schwitters and Otto Dix. The works displayed were destroyed, of course. 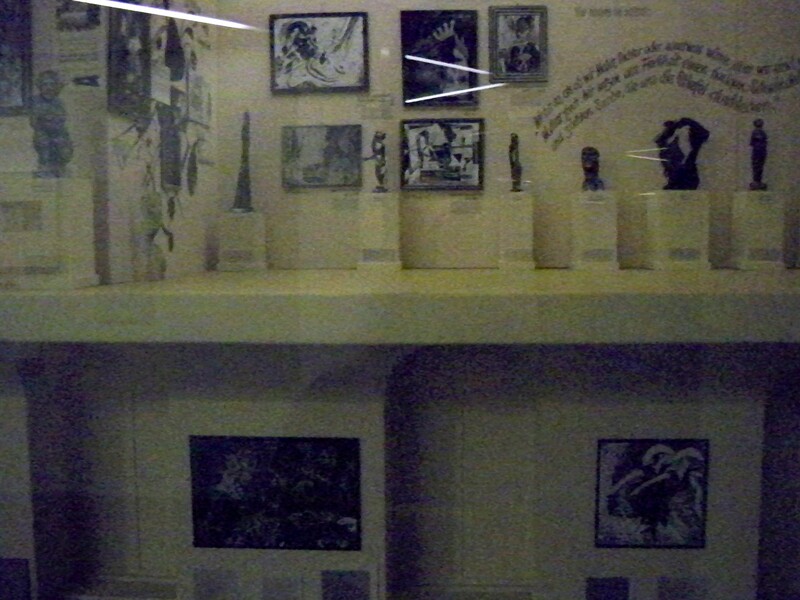 But a mock-up, in dollhouse form, can be seen at Deutsches Historisches Museum, and my very poor quality photo. I am not writing about Weimar per se. We meet my main character in 1940. But just as history begets history, characters are formed from their histories and the choices they make based on past experiences and the ghosts they bring with them. I am working on my character’s ghosts, of which she has many. But the biggest ghost of all is Berlin itself. Of course.